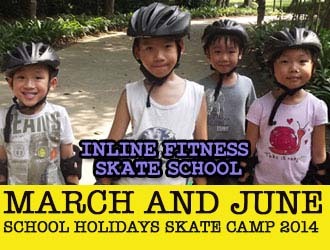 Click here for details of March and June School Holidays 2014 Skate Camp! Check out our School Holidays Activities in Singapore for Children! Have you always wondered how it is to be on skates? Inline Skating is one of the best sports to pick up. What are the benefits of inline skating? It is one of the best form of cardio workout equivalent to running or cycling. It is fun and gives you the opportunity to experience the lightness of being on wheels. At Inline Fitness, we know the benefits of inline skating as a fitness activity and we have developed an exclusive inline fitness programme for all ages. You will learn to skate and be fit on wheels! Inline Skating, also known as rollerblading is a fun and great way to keep fit! It is a great cardio workout and have similar benefits to cycling and running but without the impact on your joints. Suited for children, adults and seniors, it's a sport suitable for all ages! What can learn inline skating? Anyone who's 8 years to 60 years of age! Children will love the sport and it's a great way for adults to socialise and make friends while learning to blade! Choose from a weekend lesson, a private class or a school holiday skate camp. Schools and Corporate Lessons are also available, contact us at to arrange for a mobile skate party at your doorstep! Why learn from Inline Fitness Skate School? We are the easiest way to learn skating! Our program syllabus emphasizes on practical urban skating, designed to allow youths and adults to learn skating in a fast, safe and easy manner. Choose the following options to start learning skating today! Register for your class online! © Inline Fitness Singapore. All Rights Reserved.